Komplett USB modem för digitala moder. Kablage ingår samt utförlig manual. Once again Tigertronics sets the pace in digital operating! The new SignaLinkTM USB sound card - radio interface combines the legendary performance of our SL-1+ with a state of the art built-in low-noise USBSound Card. This ground breaking innovation delivers optimum performance while eliminating the need to attach to your computer's existing sound card. Convenient front panel controls and simplified installation make this one of the most user-friendly interfaces on the market, continuing to show that the Tigertronics SignaLink is truly the "Ultimate sound card interface"! Virtually ALL sound card Digital and voice modes are supported by the SignaLinkTMUSB. This includes traditional modes such as RTTY, SSTV and CW (to name a few), as well as today's hottest new modes like PSK31, WSPR, WINMOR, MT-63 and EchoLink. Performance on all modes has been optimized by the use of special low-noise parts and careful design techniques, while ease of operation is provided by front panel controls that let you adjust your Transmit Audio, Receive Audio and Transmit delay "on the fly". 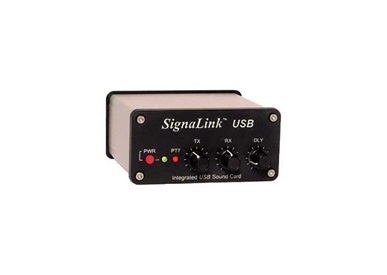 The SignaLinkTMUSB works with virtually ALL radios and can be attached to the Mic jack, Data Port or Accessory Port. Most customers will want to attach the unit to the back of the radio (Data or Accy Port), as this will allow the microphone to stay plugged in. A wide selection of fully assambled radio cables are available for all common base and mobile radios. A special un-terminated radio cable is available for radios that use a non-standard connector, or for use with hand-held radios (HTs). The SignaLinkTMUSB comes fully assembled and tested. As with all Tigertronics products, it employs "State Of The Art" surface mount construction, and every unit is Robotically Assembled in our own modern factory to ensure maximum performance and reliability . All components are of the highest quality, and every unit undergoes the same stringent quality control and inspection standards that you have grown to expect from Tigertronics! We invite you to compare every aspect of the SignaLinkTM USB to other sound card interface products. We think you will agree that we have offered a level of innovation, quality, and value that cannot be beat! Vid beställning ange till vilken transciever du ska använda ditt modem. du vill använda din "Signalink" till fler stationer. Finnes färdiga "plug and play" så du slipper strippa modemet själv. Bara plugga i och köra! Tomma moduler för att löda själv till din radio! Ring, maila för info, vi löser dina problem! Signalink USB med inbyggt ljudkort.